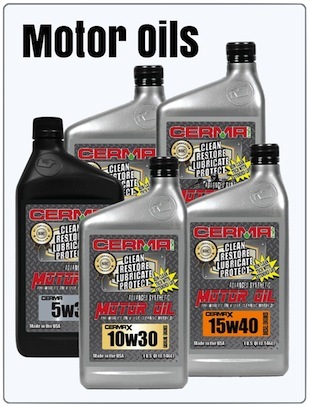 Cerma STM-3 is a revolutionary technology, which is added to the engine oil. Once added, the vehicle will restore engine performance, increase horsepower and torque, prolong operational life, and continuously clean vehicle. Cerma STM-3 is applicable to all vehicles including cars, trucks, vans, semi-trucks, and industrial and commercial equipment. Straight from the start you will see, hear and feel the difference using Cerma STM-3. 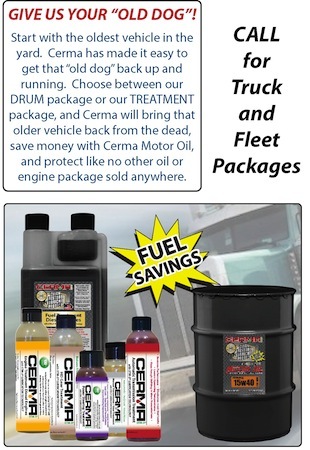 By the time the "Cerma" process is complete, your engine will be at its peak performance, have that extra horsepower, run quieter and smoother, benefit from longer oil life and protection, and increased fuel economy. Best of all, Cerma STM-3 is self-cleaning: meaning that after Cerma STM-3 is added, the engine will continuously clean itself, thus maintaining peak operational performance. Cerma offers a complete line of lubrication products to meet your needs. All fortified with Cerma’s proprietary STM-3 technology. 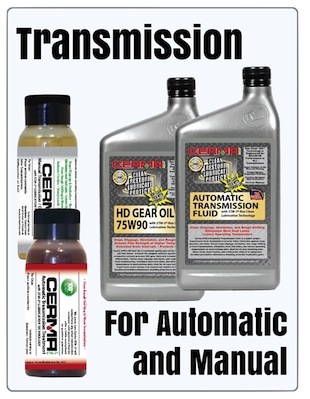 Treatments for Vehicles: Engine, Transmission, Power Steering, Gear, Differential, Hydraulic, and Vanos. Motor Oils: Offered in a number of viscosities for both gasoline, diesel, and motorcycle. Specialty Treatments and Lubes: Air Conditioning and Refrigeration, Firearm Cleaner and Grease, Air Tool Lube, High Temp Lithium Grease, and Multi-Purpose Grease. Specialty Oils and Fluids: Transmission Fluid, Gear Oils, Power Steering and Hydraulic, Compressor Oil, and Chain Oil. Money Saving Protection for your Engine! • Clean, Seal and Protect the metal surfaces of bearings,pistons, cams, crankshaft, lifters, and all other internal moving metal parts. Cerma STM-3 lubricates and protects the upper engine, prevents costly downtime, restores performance, cleans fuel tank, cleans injectors, cleans fuel lines and provides unmatched protection. 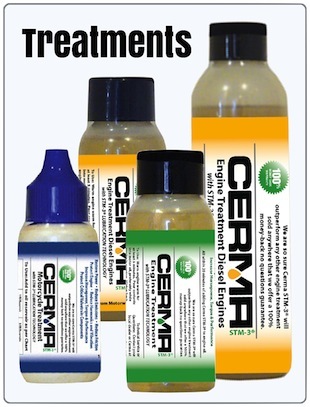 Cerma STM-3 releases the lubrication trapped inside the fuel, and allows the fuel system to properly lubricate. 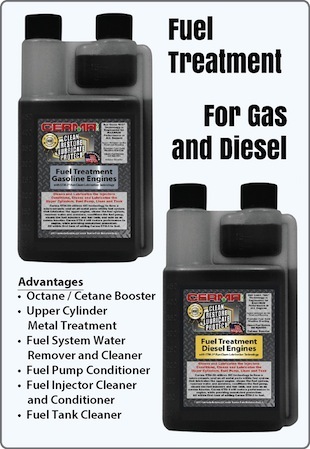 In addition, Cerma STM-3 Fuel Treatment adds a “SiC” component to the system which lubricates the upper engine, cleans the fuel system, removes water and moisture, conditions the fuel pump, cleans the fuel injectors and fuel tank, and acts as an octane booster. One of the biggest enemies of a transmission is heat. The amount of heat present in the system will normally dictate the life of that transmission. Adding Cerma STM-3 Transmission significantly reduces the heat and friction within the equipment. In addition, Cerma STM-3 addresses the extreme pressure (EP) areas, such as planetary and worn gear systems, bushings, bearings, and shafts. By penetrating the metal surfaces and embedding a thin 1 to 6 micron ceramic “SiC” coating, the Cerma process drastically reduces internal friction, leading to a reduction in oil temperature, increased transmission efficiency, and prolonged operational life. 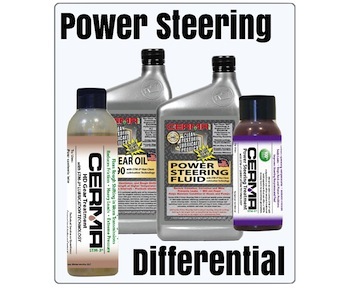 Cerma STM-3 helps maintain efficiency, performance, and the condition of power steering units. Cerma is designed to prevent leakage and squealing under severe conditions. Will not clog or foam. Helps prevent corrosion, oxidation and wear. The differential is designed to compensate for the difference in distance the inner wheels and outer wheels travel as the vehicle goes around a corner. The differential oil lubricates the ring and pinion gears that transfer power from the driveshaft to the wheel axles. Maintaining the differential is just as important as changing your engine's oil, and for the same reason. The Future of Motor Oil has Arrived! EVO is the most advanced motor oil on the market today. Protects like a 40W, runs like a 0W. 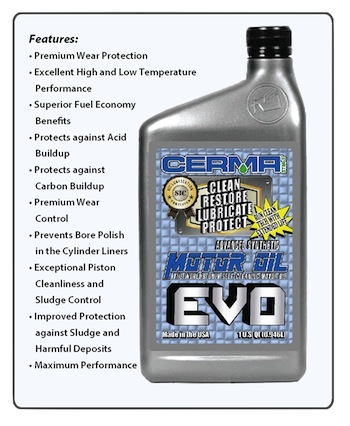 EVO is a Multi-Weight Motor Oil that reacts with the Cerma Engine Treatment to provide Maximum Protection to the Engine at a 0Weight Viscosity. 0W means the oil flows freely within the engine to further protect engine and engine parts and increase fuel economy. 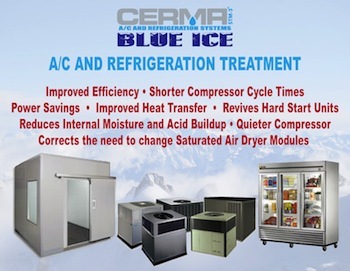 Cerma Blue Ice is a revolutionary technology that improves the overall performance of a/c units and refrigeration systems by improving heat transfer, reducing power usage and shortening cycling times. Cerma has developed Cerma Blue Ice so that even a novice can apply the product using our applicator tool, as well as video's showing how to use the tools, and the proper dosage for your needs.